Yoga used to piss me off. It may sound ridiculous, but it’s true. Friend after friend would convince me to join them for a class and time and time again I would find myself infuriated by my inability to fold, twist, or bend my body into each posture perfectly. I would look around at my classmates and their seemingly blissful states would only fuel my frustration. If this sounds like you, but you haven’t given up on yoga just yet, then I highly recommend that you check out Sunset Yoga with Mary Beth LaRue. Mary Beth is a Los Angeles-based yoga teacher and life coach and, every Monday evening, she shares her amazing practice with anyone who wants to join her for a sunset yoga session right on the beach! One of my favorite things about these sandy Vinyasa flow sessions is the way the sand changes the practice. Because it moves under your feet as you shift in and out of different postures, it’s almost impossible to attain perfect poses the way you might be able to in a studio with a solid, flat surface. Mary Beth commented on this at the beginning of my first sunset beach yoga session and I immediately felt so liberated. By being forced to let go of my pursuit of perfection, my practice became lighter, more carefree, and I was able to be more present. My attention opened up to include, not only my physical movements, but my broader experience as well. The salty smell of the ocean, the feeling of the fading sun on my closed eyelids, and the gentle, soothing sound of the waves became a part of my practice. I was able to allow my energy to soften, and then my body was able to follow suit, moving through the flow sequence with an easiness and joy that I had never previously experienced in a yoga class. As the class came to a close, Mary Beth invited us to come all the way down to the ocean’s edge and to try forming some of the postures in the shallowest part of the water. As I found my way into downward facing dog, I dug my hands into the wet sand and looked through my legs at the upside-down ocean behind me. I watched the water wash over my feet and ankles and laughed at how silly I must look, but didn’t care. I finally understood what everyone else in all of my other yoga classes must have been experiencing. It was the simple joy of being alive, in this body, right now. 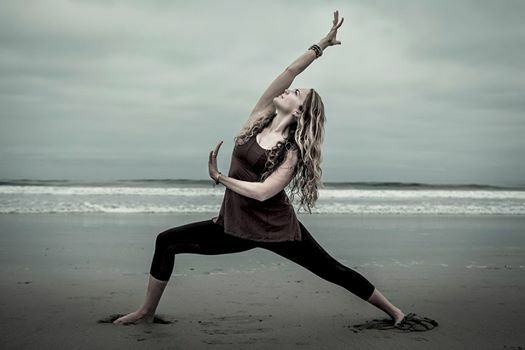 Whether you have been a dedicated yogi for years or you are still trying to find your yoga stride, Mary Beth’s Monday evening beach yoga classes just might help you reach a whole new level with your practice! At $10 per class, it’s a steal and with an expansive beach setting, you don’t have to worry about classes filling up or having to squeeze your practice into a tiny space. Now that’s a yoga session that I can get down with! TBT – Fashion: White after Labor day?